As the Australian Open draws came together, the TTI Staff convened in their secret lair to hash out all the details heading into the first major tournament of the season. Just who has the edge Down Under? Check out Part I of our super-sized roundtable, where we talk through what promises to be quite an exciting men’s event. 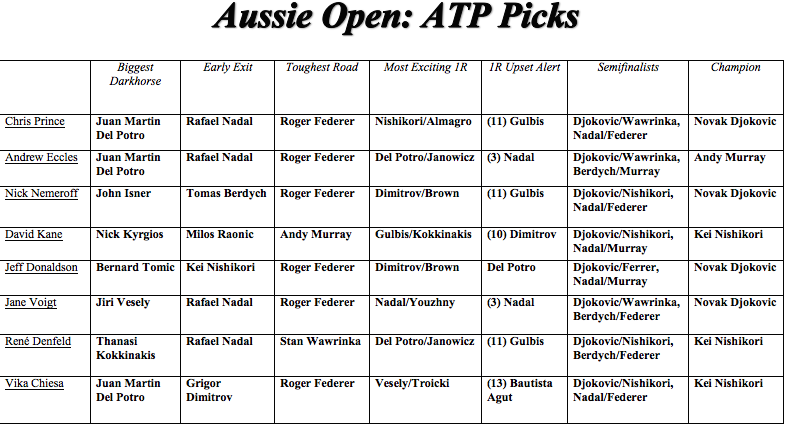 Stay tuned for our WTA picks, out Sunday morning! Check out the crew’s full picks compiled into an easy-to-follow grid at the bottom. He may have fallen to a qualifier in the Sydney quarterfinals, but the 6’5″ giant teddy bear Juan Martin del Potro is still a force to be reckoned with on big stages. He’s coming off an 11-month injury hiatus – that will hinder his chances heading into the Australian Open – but if he can navigate the fiery Jerzy Janowicz in the first round, I don’t see why a fourth round showdown with No. 8 seeded serve master Milos Raonic can’t be in the cards. And if he comes out victorious, there’s a delicious quarterfinal against the world No. 1, Novak Djokovic. Any time Juan Martin Del Potro is floating unseeded in a Grand Slam draw, you’ve got to pick him as a dark horse. He’s just so powerful and so capable of great tennis. That said, a victory – or even a deep run – for the Argentine would be extraordinary, considering how tough his draw looks. To reach the final he’d have to beat: Janowicz, Monfils, Lopez, Raonic, Djokovic, Wawrinka / Nishikori. That would be darkest horse ever to canter. On the ATP side, I think this is going to be an excellent tournament for the top guys and seeded players, but if I had to pick one darkhorse, it would be John Isner. Isner can threaten any opponent with his serve and, with a possible fourth round match against Novak Djokovic, this could be a big moment for the American, who is now under the guidance of former player and Tennis Channel commentator, Justin Gimelstob. A darkhorse in the truest sense of the word, Nick Kyrgios has the game, personality, and home-court appeal to turn the Australian Open on its head. With a potential third round rematch with No. 15 seed Tommy Robredo looming in the third round, I have a feeling the Master of Swag will have learned a thing or two from their US Open encounter. Against Federer in the fourth round, anything is possible, as he proved by unseating Nadal at Wimbledon. Should the two face-off to start the second week, they could conspire to play the best match of the tournament. In our pre-season roundtable, I chose this player to make big strides in 2015 and having seen his place in the Australian Open draw, I’ll chose him again. Bernard Tomic has both the game and the draw to make a deep run at his home Slam. He always plays his best at home and with Kyrgios and Kokkinakis taking some of the spotlight off him, he’s had the space of mind to work up to his potential. In a section of the draw with Philipp Kohlschreiber whom he beat handily this past week and Ernests Gulbis who is prone to puzzling losses, this might be the perfect opportunity for Tomic in the land down under. Jiri Vesely. At 21, this 6’6″ Czech lefty has to be counted as one to watch, as one of the veritable new kids on the block. Into his first career final at the Heineken Open Saturday, Vesely could arrive at Melbourne Park at his most confident. In the past week, he scored wins over Kevin Anderson and Ernests Gulbis. Both men are in Vesely’s quarter of the draw. Currently ranked No. 63, he will face Viktor Troicki in the first round. Troicki is returning from a suspension for refusing to take a drug test in 2013 and posed a formidable test. If Vesely can put together a win over the Serb, he should relax and and string a second win, and likely face Tomas Berdych in the third round. Berdych reached the semifinals last year, but can go off the rail at the most inopportune moments. I think there is plenty to play for in the third quarter of the draw, with unseeded players like Sam Groth, Bernard Tomic, Thanasi Kokkinakis, Jiri Vesely, and even Viktor Troicki. Any of these men could take advantage of what is a softer section in the draw. I will stick my neck out and say Kokkinakis – but it could be any of the names mentioned above. If you look up unseeded and looming in the Australian Open 2K15™ dictionary, chances are you’ll find this picture of Del Potro. Though this is an unlikely prospect, third-seeded Rafael Nadal looks to be in a vulnerable position heading into the first major of the season. Nadal lost a blowout match to Andy Murray in Abu Dhabi, bottoming out, 6-2, 6-0. While it may have only been an exhibition match, the one-sided scoreline revealed the effects of what an injury layoff can do. Beyond that, Nadal’s Melbourne draw isn’t a walk in the park either. He’ll open against the argumentative Russian, Mikhail Youzhny. The third round could be another possible Grand Slam face off with old nemesis, Lukas Rosol. Whether that will result in a repeat of Rosol’s sensational victory over Nadal at Wimbledon 2012, only time can tell. I can’t look much further than Rafael Nadal on this one. He has looked ropey since his comeback began in January, which is understandable given how long a break he’s had with injury. Nadal also has a tough opening round match with Youzhny, so I think all of that converges into a real red flag. I don’t think that Nadal is just the “most likely” to suffer an early exit, I think that he will definitely be out of the competition earlier than the semi-final which, for any Big 4 guy, is an understandable shock. However, look for that to provide a clear opening for No. 7 seed, Tomas Berdych. Speaking of Tomas Berdych! He’s likely to get through to the quarterfinals where he could face Nadal, but he could also come up against some serious tests along the way. Vesely, Troicki, and Leonardo Mayer all loom as potential third round opponents while Kohlschreiber, Gulbis and Tomic as fourth round opponents. On the other end of the Aussie spectrum, I could see Lleyton Hewitt making waves and sending No. 8 seed Milos Raonic home earlier than most would expect. The newly coiffed Canadian comes into the Happy Slam high on confidence, but likely feeling the pressure. With his ever-expanding portfolio of impressive results, the level of expectation will only continue to increase, and we’ve yet to see how Raonic will respond to being considered a well and true favorite to capture his first Grand Slam title. He doesn’t seem the type to fold under pressure, but it did take the former No. 6 three years after his first major breakthrough – here in 2011 – to reach his first Grand Slam quarterfinal, and that was in Paris, where no one was watching. All eyes will be on Raonic in the first week; see if the big server blinks. The signs point to Rafa Nadal as primed for an early upset, drawing Mikhail Youzhny in the first round – a player who has defeated a few times in majors. However Youzhny lost rather meekly to a qualifier in Doha this year and his results seem to be slowly declining after a highly consistent career. Nicolas Almagro, however, is still at a prime age to record some strong results and he faces No.5 seed Kei Nishikori in the first round. If he can find some of the form that had cemented him in the Top 10 for years, he might be able to upend the talented but occasionally erratic Japanese superstar. Rafael Nadal. Nadal missed so much last year, out with wrist and back injuries plus surgery to remove his appendix, from which he admits he is still recovering. This will be the third major comeback of his career. In 2013, during another renaissance, the Spaniard went on to win 10 titles, making the year one of his best. But at 28, the No. 3 seed will have more trouble simply due to aging, and residual wear and tear. In his only ATP match of 2015, he lost in Doha to Michael Berrer, ranked No. 127. Nadal has victories over Youzhny in five previous major tournaments, two which went five sets. The Russian’s experience and variety will test Nadal, who will be forced to risk at a time he not completely up to speed. Based on some of Wawrinka’s erratic results in 2014, an early exit isn’t entirely out of the question, but his draw into the 2nd week is as soft as cheesecake, and he seems to have played himself into decent form with a win in Chennai. I don’t see any of the Top 8 falling before the Round of 16, truth be told, but right now, it feels like Nadal could be the most vulnerable in the early stages – crazy as it may sound to some people. While Nadal is an easy choice, I’m going to head a little further down the Top 10. I’m not sure if Grigor Dimitrov is going to live up to his seeding and make the second week; the Bulgarian has a tough opener against German Dustin Brown, a man whose flashy game is accompanied by a larger-than-life personality. Should he navigate that, a third round match against the man of the moment – No. 20 seed David Goffin – looms. Whilst the Swiss Maestro may be in pristine form following a title victory at Sydney last week, there’s no doubt second seeded Roger Federer has the toughest road to the final out of the Top 4. Federer’s first seeded opponent is projected to be Jeremy Chardy in the third round. All three of their encounters went the distance in 2014. The next round sees veteran Tommy Robredo in the fold. The Spaniard defeated Federer the last time they met in a hard court Grand Slam, at the 2013 US Open. The uphill battle continues with either Grigor Dimitrov or Andy Murray in the quarterfinals. And, if he comes out unscathed, Federer will have to faceoff with longtime nemesis, Rafael Nadal in the semifinals. Of course, Federer is no stranger to difficult draws, but even for the second seed, this looks like a daunting process. Without a doubt, it’s Federer. The Swiss finds himself in a quarter with Andy Murray and Grigor Dimitrov, both of whom could be big threats. Murray has looked in fine form at the start of 2015, and has always had a good record against Federer, so he isn’t a name that Federer would have wanted to encounter as early as the quarter-final stage. If he can get past that point though, I think he’ll reach the final, as his semi-final opponent is more likely to be Berdych than Nadal. It’s a tough call between Federer and Djokovic but I’d have to go with Federer based off their prospective quarterfinal and semifinal matches. Their first few rounds could bring challenges with Djokovic having potential matches against Fernando Verdasco and John Isner; Federer having potential matches against Borna Coric/Jeremy Chardy and Ivo Karlovic/Nick Kyrgios. Djokovic’s projected quarterfinal and semifinal matches are against Raonic and Wawrinka, while Federer’s are against Murray and Nadal, which is decidedly tougher row. To the extent that he’s expected to make the final, Andy Murray has, by far, the toughest road. The Brit is feeling good about the state of his game, which is good for him since he’ll need it in spades starting from the second week. Assuming the seeds hold, the three-time Aussie Open finalist would have to go through No. 10 Grigor Dimitrov, No. 2 Federer, and No. 3 Nadal just to have a chance of playing No. 1 seed Novak Djokovic for the trophy. Nadal may have his issues and Federer may have a tough road too, but those mourning the end of the Big 4 are still poised to laud a miraculous recovery by tournament’s end. Murray’s had plenty of success Down Under, and the match-ups are all interesting ones for this eternal student of the game. For his own sake, however, I’m sure he’d sooner swap places with No. 5 seed Kei Nishikori. While Novak Djokovic has a few big servers in his path and Nadal has an old foe in the first round, I feel Roger Federer has the toughest road to the final. While his immediate section may not present too much difficulty, apart from a potential matchup with Ivo Karlovic or US Open 2013 conquerer Tommy Robredo, his QF opponent could be Andy Murray and Nadal may await him in the semis. Making the second week shouldn’t be difficult, but making it to the final might be. Looking for his fifth Australian Open title – and his 18th overall – Federer will have to remain as calm and aggressive as he has appeared over the last 10 months. Initial rounds should not pose problems, but Jeremy Chardy could challenge Federer in the 3rd round. They met three times in 2014, Federer with the edge, but each match went 3 sets and Chardy pulled off the win in Rome. Tommy Robredo or Ivo Karlovic should be winnable in Oz but come the quarterfinals Grigor Dimitrov will be across the net, if he has defeated Andy Murray. Federer last won in Melbourne in 2010. With his 1,000th match win filling his sails, there’s no reason why this cranky section of the draw can’t be mollified. When I first saw the draw, my gut said Federer. But then I looked again and just based on potential quarter and semifinal matches, I think it would be a big ask of Wawrinka to beat Nishikori and Djokovic back-to-back to even make the finals. Add to that the pressure of being the defending champion, and the head of the ATP’s “Second Line” may be in over his head the second time around. Federer’s draw is ostensibly the toughest, but I still expect the World No. 2 to navigate whatever path is put in front of him. He might have to expend more energy that he’d like to in order to get there, however, and that could pose a different kind of challenge for the 33-year-old to overcome late in the second week. My initial reaction would’ve been to pick the match between unseeded Del Potro and Jerzy Janowicz. But to mix things up, I’ll go with fifth seeded, Kei Nishikori vs the dogged Spaniard, Nicolas Almagro. The pair have only met twice before, both on Asian soil. Both were pushed to three sets, both involved a tiebreak and both were fractions apart in overall points won. It’ll be interesting to see, then – especially following Nishikori’s pedigree form over 2014 – what will become of their first round. Will it be a five set thriller? So often Almagro likes to push the limits. Or will Nishikori take responsibility of his ranking and swiftly navigate the Spaniard with ease and precision? Del Potro vs. Janowicz should be really fun. Who doesn’t want to watch two giants battling it out under the hot Australian sun? Dustin Brown vs. Grigor Dimitrov. While Dimitrov will enter as a heavy favorite, Brown can beat anyone on his best day. The shotmaking should be nothing short of spectacular. If you’re on the grounds next week and can catch this match, I certainly recommend doing so. For exponential entertainment, I have to pick Ernests Gulbis vs. Thanasi Kokkinakis. The expressive Latvian has had his best major results on clay, and has only reached the second round of the Australian Open twice in his career. The flashy Kokkinakis had a good week in Brisbane, where he took out Julian Benneteau before losing a fun match to compatriot, Benard Tomic. It’s without question that these two will get a show court, and what ensues from there will surely include big hitting and high theatrics. While I’m looking forward to seeing if Almagro can challenge Nishikori in their first round matchup, in terms of pure entertainment potential Grigor Dimitrov vs. Dustin Brown should be exciting. They have a contrast in styles but a similarity in miraculous shotmaking; this matchup should have a few points for the highlight reel. Rafael Nadal vs. Mikhail Youzhny. This is a test for both, but one with more dire mental and ranking consequences for Nadal. The No. 3 seed will have to do more than bash balls from the baseline to upend the talented Russian. I’m going with Del Potro/Janowicz. Will Del Potro’s wrist hold up for more than three sets? Is Jerzy Janowicz going to come out focused mentally? Will there be momentum changes aplenty? And – how many times!? Shout out to Gulbis-Kokkinakis, Almagro-Nishikori and Dimitrov-Brown. I’ll take a clash of two unseeded players who come into Melbourne in scintillating form. Czech Jiri Vesely – who I picked as my player to watch the last time we got together in our preseason round table – is coming off of his first career title this week in Auckland, and he’ll face the “other” comeback kid man Viktor Troicki to open his Australian Open campaign. Troicki had a great week in Sydney himself, coming through qualifying to win the title. Something’s got to give – and someone’s got to lose – but this could certainly be a long one. Thanaski Kokkinakis d. (11) Ernests Gulbis. The first round between Kokkinakis and Gulbis could be a popcorn match for the Aussie crowd. The young Kokkinakis may only be on the periphery of the world’s Top 150, but he has made the second round of the Australian Open before, in 2014. Gulbis has showed little form at the start of the season, falling to the Czech youngster, Jiri Vesely in his opening match at the Heineken Open. Could another 90s kid be ready to upset a seed, only this time on one of the tennis world’s biggest stages? Mikhail Youzhny d. (3) Rafael Nadal. Nadal vs Youzhny is easily my pick. I don’t particularly trust Youzhny to play at his best under pressure – and the pressure will certainly be on – but I also don’t think that Nadal’s game is yet at a good enough level to take him deep into the tournament. If Youzhny catches Nadal cold right at the beginning of the tournament, it could be an opportunity for him to take a big scalp. Thanaski Kokkinakis d. (11) Ernests Gulbis. I’d be shocked if this is not a night match on Rod Laver Arena. The young Aussie will have the full support of the crowd as he takes on one of the most alienating figures in the game in Ernests Gulbis. Kokkanikis has the tools to get this one done and Gulbis has the mental makeup to make a mess out of this first rounder. Dustin Brown d. (10) Grigor Dimitrov. This is a moment the German veteran lives for. With an explosive serve and showy all-court game, Brown could catch a still-young Dimitrov off-guard to begin the tournament. He typically posts his most startling results on grass, and I don’t see him following this potential upset up (should he pull it off), but Dimitrov has only just begun his quest for serious Slam success, and I’d be surprised if he didn’t suffer one more hiccup along the way. Del Potro may not be seeded, but he’s still a huge name who’s facing a huge first round opponent in Jerzy Janowicz. He won a few matches in Sydney, but his backhand appeared extremely suspect. If he can’t manage to get to tiebreakers with the big serving Pole, he stands a chance to make an early exit. Mikhail Youzhny d. (3) Rafael Nadal. If Nadal loses to Youzhny, his year will be clouded and altogether unclear. The tournament will suffer, as well. Nadal is so well liked everywhere, especially at Grand Slams. More speculation will surface about his health and longevity. Bad news all around. Thanaski Kokkinakis d. (11) Ernests Gulbis. I’m going to go with Gulbis, corresponding with my pick of Kokkinakis doing things. The Latvian just looked the very opposite of sharp in Auckland this week. Dominic Thiem d. (13) Roberto Bautista Agut. The Spaniard had a career year in 2014, but one can’t help but feel as though he’s reached his ceiling. Thiem certainly hasn’t, and I’m certain that the young Austrian will get some tips on how to diffuse the Spaniard’s game from BFF (and known Bautista antagonist) Ernests Gulbis. Djokovic/Wawrinka, Nadal/Federer. Though predicting shocks and upsets may be fun, I still believe there will be uniformity once we reach the second week of the Australian Open. Of course, the world No. 1 Djokovic should be a shoe-in for the top half of the draw, and I’ll pit him against the defending champion Wawrinka, who’ll do well to navigate past Nishikori in the quarterfinals. In the bottom half I see Nadal, even with his injury woes, outmaneuver Tomas Berdych to set up a semifinal showdown with none other than Roger Federer. Djokovic/Wawrinka, Berdych/Murray. The Serb and Swiss will both have to get past the threats of Raonic and Nishikori, respectively, but I think they will put it out of the bag. Lots of people have said that Wawrinka will collapse under pressure in Australia, but I’m not ready to write off the defending champion that easily. Murray is likely to have to pass both Dimitrov and Federer, but he certainly looks up for the task. Berdych, meanwhile, has a relatively friendly draw if he can rely on a surprise early exit from Rafa. Djokovic/Nishikori, Nadal/Federer. Djokovic loves the Australian Open and I expect him to get through major tests in Verdasco, Isner and Raonic. A potential fourth round match against David Ferrer seems likely for Nishikori, and if he can get through that one, I like his chances against Wawrinka to book a spot in the semifinals. Nadal has an extremely soft draw, let’s be clear. The only two players I see challenging him prior to the quarterfinals are Lukas Rosol and Tomas Berdych. Expect Nadal to still be around at the end of the second week. Federer is playing as well as I’ve seen him play in quite some time. His performances against Dimitrov and Raonic in Brisbane were eye opening. A tough quarterfinal match against Murray will put him to the test but look for him to face Nadal in the semifinals. Djokovic/Nishikori, Nadal/Murray. The loss to Karlovic was likely a wake-up call for Djokovic, who will likely be on his game through the first week, priming himself well for a fifth Australian Open final. But he’ll have to get past Nishikori to do it, and that proved more difficult than it appeared in Flushing last year. The Japanese star has a kinder draw through the first week, and proved his durability en route to his first major final in August. Djokovic will be ready for a rematch, and Nishikori will no doubt come to play. I’m less inclined to bet on Nadal losing early. For all the talk of his inconsistencies, a healthy Nadal tends to excel at major tournaments. His two quarterfinal losses Down Under since winning in 2009 both came when the Spaniard was suffering with an ill-timed injury; in his other two appearances, he reached the final. Meanwhile, Murray will be looking to make an early charge at his most consistent Slam tournament. With three runner-up trophies to his name, it’s a wonder he didn’t make Australia his major breakthrough. This one might have less mutual intensity, but I’d expect the Brit to come out looking for redemption should he find himself six sets from a third Grand Slam title. Djokovic/Ferrer, Nadal/Murray. With Nishikori out early, look for Ferrer to do what he does best and take advantage of another wide-open opportunity to reach the second week. Should Nadal make it through his opening round, I see him only getting stronger. Djokovic/Wawrinka, Berdych/Federer. The Swiss contingency has moxie in spades. Winning Davis Cup teammates and friends, they have nothing to fear over the fortnight. They just have to keep their concentration on track and swing out. Wawrinka, of course, is vying to repeat in Melbourne. He defeated Djokovic in the quarterfinals last year, don’t forget. The Serb has changed since then, proving more durable and more capable. He won Wimbledon, bringing his Slam final record up to 7-7. Fatherhood has tempered his on-court attitude for the better. This will make the difference, as he pulls off the win and try to capture his fifth crown. Berdych is defending semifinal points from 2014. His four-set loss to Wawrinka last year, which included 3 tiebreak sets, should not be far from the front of his mind. Berdych also has hired a new coach, showing a renewed interest in pushing himself, a difficult task considering the era he has played in. He is certainly capable of defeating Federer. Their games match up well, and they are seasoned in slams. However, Federer’s repertoire has expanded when compared to that of Berdych, although the Czech can show a flair for variety. The variety from Federer coupled with solid serving should put him in the final. Djokovic/Nishikori, Berdych/Federer. I’m not sure I am really picking Tomas Berdych. It might be more of a case of not picking Rafael Nadal. Which will probably come back to haunt me. Djokovic/Nishikori, Nadal/Federer. I’m looking forward to a rematch of the US Open semifinal between Djokovic and Nishikori; the Flushing finalist will be playing the top seed at his best Slam, and a classic encounter isn’t out of the question. And who doesn’t want to see another Fedal match? It’s a tricky one to call. Will Wawrinka repeat his sensational run to the title, defeating Djokovic again in his path? And will Federer get over the Nadal hurdle that has long hurt him in the past? My champion for the Australian Open 2015 is Novak Djokovic. I predict he’ll be victorious against Roger Federer in a four-set final, in a match that will reignite their 2014 rivalry that saw them play one of the best men’s matches of the year at Wimbledon. The Happy Slam is Djokovic’s most successful career endeavor, and he’ll repeat that trend to start what could be another high quality season. Andy Murray looks in great form at the start of this year, and I’ve always found that Murray has tended to win the Slams he’s gone into looking like a winner. At the start of the Australian Open, Murray seems ready to take on the world. Novak Djokovic. His half of the draw is the place to be and while Nadal, Murray and Federer are whittling each other down on the bottom half, Djokovic will take comfort that he won’t have to face any of his three biggest rivals, and no more than one in the final. If Djokovic does reach the final Sunday, the only way I see him losing is if Federer is there, which I suspect he won’t be. Kei Nishikori got so close at the US Open, that his arrival to the final felt like destiny fulfilled. He silenced his critics and weathered three straight stormy matches to teach Djokovic a lesson he won’t soon forget in the semifinals. While few could have conquered an inspired Cilic in the final, there won’t be the same number of hungry bellies heading Down Under, with the Croat nursing a shoulder injury. Though Nishikori lost a tight three-setter to Raonic in Brisbane, he fought through the end, and with an adaptable game, may just be the most mentally tough of his generation. If the US Open felt like destiny fulfilled, winning the Grand Slam of Asia/Pacific might just feel like it was written in stone. Djokovic. Having won this event three times in the last four years, the Serb knows and loves these courts. It’s safe to say last year’s defeat to Wawrinka was a loss he should have avoided, and he’s looking fit and motivated as ever to win his fifth Australian Open crown. Novak Djokovic is just too good now. Although Federer has a winning record over the No. 1 seed, his refined tennis is currently the best. With the added confidence of his Wimbledon win over Federer, the four-time champion should lasso his fifth Norman Brooks trophy. This is largely a gut pick, as I do not have absolute confidence in any of the usual suspects. I’ve stated multiple times that I believe Nishikori will end up winning a Grand Slam this year, and I wouldn’t be surprised if he managed to pull it off in Melbourne – he did some impressive giant-killing getting to the US Open finals, and this time I wouldn’t put it past him to do it and lift the trophy, particularly if he remains healthy. It seems weird to be so confident in picking a non-Big 4 guy to win a major title, but 2014 just may have been a turning point for the decade-plus long era. Nishikori got so close at the US Open, that if he’s feeling healthy and better conserves his energy through six matches, I expect him to be on point heading into the final. What better way to start the season than with one more surprise?